This probiotic-cultured formula is an industry first in anti-aging and cellular delivery. Neuro-ND™ provides never-before-available health benefits, including premier nerve and brain cell nourishment. DHLA (Dihydro-lipoic acid) has been studied worldwide because it is one of the ultimate anti-aging agents to quench free radicals. However, no one has been able to stabilize live-source DHLA - until now. DHLA, Dihydro-lipoic acid is a more potent form of Alpha Lipoic acid. This is one of the most potent anti-oxidants as it is both fat and water soluble. Products Related to Neuro-ND | DHLA, 8 fl. oz. Stabilized DHLA (Dihydro-lipoic Acid), Resveratrol (Polygonum cusp. ), Bifidobacterium Species (breve ss. breve, infantis ss. infantis, longum), Enterococcus Species (faecalis TH10), Lactobacillus Species (brevis, acidophilus, bulgaricus, casei ss. casei, fermentum, helveticus ss. jagurti, plantarum), Streptococcus thermophilus. 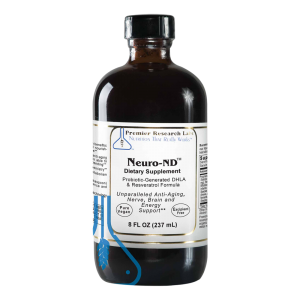 Neuro-ND™ supports superior brain and nerve chemistry, memory, metabolism and ATP synthesis. Our formula contains a highly effective 80 mg DHLA per 1/4 teaspoon, Resveratrol is also included in this formula (5 mg per 1/4 tsp) to promote ideal cell resonance and full body rejuvenation. Dihydro-lipoic acid is a more potent form of alpha Lipoic acid. This is one of the most potent anti-oxidants as it is both fat and water soluble. It is the only nutrient that is able to quench every free-radical that exist both in the human body's water and fat tissues. This product provides unprecedented free radical and excitotoxicity protection, which helps revitalizes cellular energy, prevent neurodegeneration, and stimulates anti-aging. In the last 25 years there has been a 50% reduction of the antioxidant content of foods, which makes this modern day super-antioxidant a crucial player for protecting ourselves from accelerated aging and nuero-degeneration. Quantum DHLA, a special reduced form of alpha Lipoic is my top choice. Combine a 1⁄2 tsp. of this in a quart of water with the Super Nano Green Tea, CoQ Quinol, and Max Stress B for a powerful boost in cellular energy, neurological protection, stress relief, and anti-aging. It is specifically used in Europe and at the Tree of Life Rejuvenation Center to help reverse diabetic neuropathies. Our choice is the live, hydrogenated alpha Lipoic acid from Premier Research Labs. These support post-natal jing. Okay so, DHLA is unique in a sense it helps quinch both fat and water soluble antioxidant and it helps rebuild the used up antioxidants. It helps them become active antioxidants again. And it works both in fat and water soluble. Now, it does have another very important quality which is it's very specific for neuropathology in diabetes. It is a rare occurrence that people come to our 21-day program with severe neuropathologies are clear of it after three weeks. It takes about three weeks. Rarely does a person leave with a neuropathology or it's just very, very trace. And this is also a prescription drug-- It's fasting, right? Well not for three weeks, just one week. But the 21-day program, a week is fasting. But not, yeah I was just saying, but in Germany, DHLA is, or alpha lipoic is actually a prescription medicine for neuropathies. For what? A diabetic neurophathy. Mix 1/4 teaspoon in 1/4 cup liquid, 2 times daily. Sip slowly for best absorption. Shake gently before use.